Ralph Rambo was born in 1894 in San Jose, California. His childhood home was near the intersection of Lawrence Expressway and Sevens Creek Boulevard in Santa Clara. Probably as a gift to his grandchildren he created his "Pen and Inklings". Hand written personal history of his growing up in the Santa Clara Valley in the early 1900's. His Pen and Inklings gives a glimpse into what the valley must have looked like through a boy's eyes. Lots of interesting stories and lots of good local history. 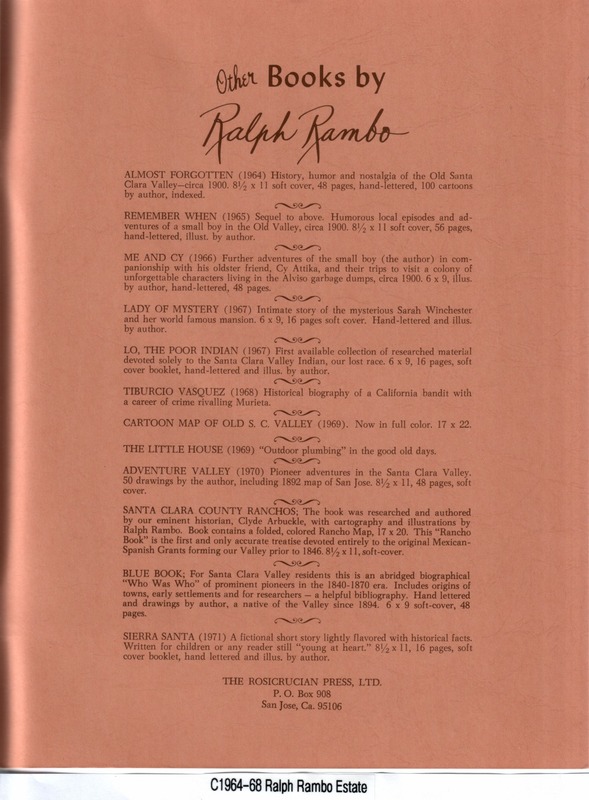 "Almost Forgotten, Cartoon Pen and Inklings of the Old Santa Clara Valley"
Ralph Rambo's Pen and Inklings are orphaned works at this point. The booklets are no longer published and I do not know the location of Ralph Rambo's heirs. I am publishing a scanned reproduction of his work under fair use for educational purposes only. I am hoping that 4th grade teachers teaching California History will find it useful to share with their students. His "Pen and Inklings" are a valuable resource about early history of the Valley. I think that residents of the Santa Clara Valley, the Bay Area and California will find it interesting and enlightening as well. I think this is how Ralph Rambo would want his wonderful works used. Please contact me if you are related to Ralph Rambo. I would like to talk to you about your grandfather or great grandfather. He drew wonderful books and told interesting, fascinating and funny stories about the Valley in its early days.